It is extraordinary to think that this dazzlingly lavish, twenty-foot high, pulpit was made for an Irish Catholic church just half a century after the devastation of the Great Hunger. It captures the most remarkable aspect of the second half of the nineteenth century in Ireland: the triumph of a new, highly organised Catholicism that took control of many aspects of life. From the trauma of the famine emerged an institution that defined the identity of the majority of the population for the next 150 years. The pulpit is of a mediaeval grandeur. 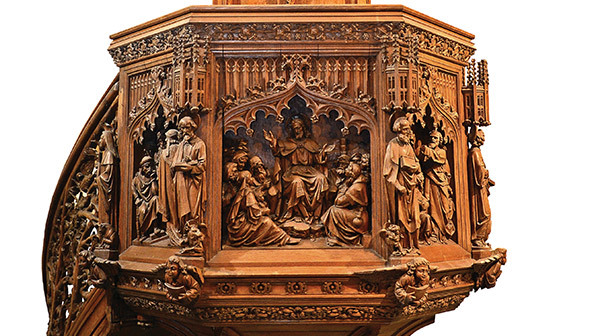 It was carved, from the finest oak, by artists in the Belgian city of Bruges and unveiled in the Cathedral of the Assumption in Carlow in October 1899. While the execution may be foreign, there is no doubt that the overall conception of the piece is specifically Irish. The message of the pulpit is that the Irish church is now fully intertwined with European, and therefore Roman, Catholicism. The first panel, just below the balustrade, shows St Patrick preaching to the High King at Tara, with a statue of St Brigid beside it. Other Irish saints, Laserian and Conleth, are represented on further panels. The image of St Paul is based on a Raphael painting in the Vatican and the crucifix on the reredos is based on a painting by Van Dyke in the cathedral in Bruges. Thus, Irish Catholicism is fully fused with the universal church. There is another message too. An angel at the base holds a scroll that says Vox Hibernorum—‘the voice of the Irish’, an allusion to Patrick but also a reminder of who it is that now speaks for the Irish. Almost all the scenes on the panels are of preaching, and the majesty of the pulpit itself, raising the priest high above the congregation, declares the absolute authority of the preacher’s voice. A massive programme of church building had begun in Ireland even before the famine was over. Churches designed by the great English neo-Gothic architect Augustus Pugin, notably Enniscorthy and Killarney cathedrals, were being built even while millions were starving. Under the leadership of Paul Cullen, who became archbishop of Armagh in 1849 and Ireland’s first cardinal in 1866, the church co-operated closely with the state, assumed control of the primary education and health systems (largely through orders such as the Christian Brothers and the Sisters of Mercy, founded by Edmund Rice and Catherine McAuley, respectively), and became highly centralised, authoritarian and dogmatically orthodox. A ‘devotional revolution’ submerged older, semipagan practices that centred on holy wells, patterns and wakes and instead structured religious life around sacraments, sermons, missions led by fiery preachers and confraternities. In this revolution, the church gained control of the process of modernisation, shaping the ways in which Irish people learned to conform to Victorian standards of comportment, and imposing rigid sexual ideals. It gave a society shamed by a great catastrophe a way to be respectable. In its beautiful new places of worship, the church provided calm, comfort and dignity. For millions of emigrants, its universality guaranteed a crucial element of continuity that helped them live with massive disruption. These benefits came at the cost of obedience, but for most Catholics that seemed a price worth paying.